Specialist for framed african art, masks, sculptures etc. This picture gallery is specialized in framing of African Art. They are also trading with traditional and modern African Art like masks, sculptures, wire works, dolls, carvings and paintings. They sell African interior decoration articles, like homeware, furniture and pictures. As an additional service they offer vacation and the organization of trips to Southern Africa. This company has spent many years with completing a collection of common and rather rare pieces of art originating in places from West Africa, the jungles of Zaire and Burundi to the swamps of the Okavango, from the desert of Namibia to the Kingdom of Swaziland. Each and every piece is the individual interpretation of the artist, and creates its own special energy. 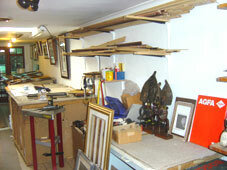 Individual pieces are carefully selected, superbly box mounted and framed to the highest standard by the company. Color and style co-ordination is chosen to enhance the intrinsic value of each framed work. Every piece is uniquely hand-made and no two are exactly alike. A detailed description of the heritage of each piece is available on request. The "dark continent", shrouded in mystery and a world unto itself. Ancient kingdoms inhabited by exotic peoples and tribes steeped in warrior traditions and complex ritual. Africa is renowned for its relics, artifacts, carvings, and a myriad of other pieces of art, part of which are specially crafted for rituals, but a big share is also still utilized in everyday life, no different than centuries ago. Some are as old as are the valleys, that run through the landscape, others are tools of the present time. All of them have mystical powers, and are crafted with the greatest care and love to the art. Within us, the picture arises, of people sitting around the fire, telling their stories, and weaving legends about the country of their ancestors. West Africa has been shaped by two periods in its early history. Due to the formation of the Sahara desert, as well as the spreading of the Bantu language, Africa south of the Sahara could develop isolated and innovative. When seen from the historical point, some of the tribes of this region lived in very small communities, others again in well structured kingdoms. This region includes vast lands, consisting of rainforests and savannah. The spreading and mixing of tribes and cultures are the result of migrations that extend over a period of time of more than two millennia. The social structures and the Religions of the tribes in central Africa vary strongly in shape and content. Over the entire area, initiation rituals are an important part of the cultural life. Part of the religious beliefs and customs, in which sculptures play an important role, is the worship ancestors.The tribes of central Africa have come up with many different forms of fine arts. In the eastern part of Africa originate some of the earliest proofs of the existence of the human race. In a coastal area with such a long history of human settlement, which is accessible by land as well as by sea, a mixing with other cultures and ethics is natural. The purchasers of the pieces of art did not necessarily have to have the same ethnic background as the creator. In the 20th century, this situation went even further, since another market was created by colonial employees, settlers, and tourists. Some of the oldest artifacts of the African continent come from the southern Africa. The art of the southern Africa has not been understood for a long time, which has been a result of errors that concern the cultural history of the entire subcontinent. The total lack of masks and ancestor traditions has contributed to the fact that art collectors have neglected this region for a long time. The esthetical feeling of the inhabitants of this area is expressed mainly in form of articles of everyday use, jewelry, and rock paintings.